When I was in high school, history was my favourite subject. I was fascinated by how the actions of people in the past could have an impact far into the future. As Justice Connect prepares to celebrate its 25th birthday, I’ve been thinking again about history and how it shapes the future. Almost 25 years ago, a small group of passionate and creative lawyers saw an opportunity to advance the public interest by engaging more lawyers in pro bono work. They established Australia’s first pro bono clearing house (PILCH) in New South Wales. Two years later, a group of law firms and public interest lawyers adapted the model for Victoria. From humble beginnings, the vision of those founders has helped build a thriving pro bono culture among Australian lawyers today. The fledgling PILCHs have become Justice Connect, which plays a leading role in harnessing that commitment to the cause of justice. 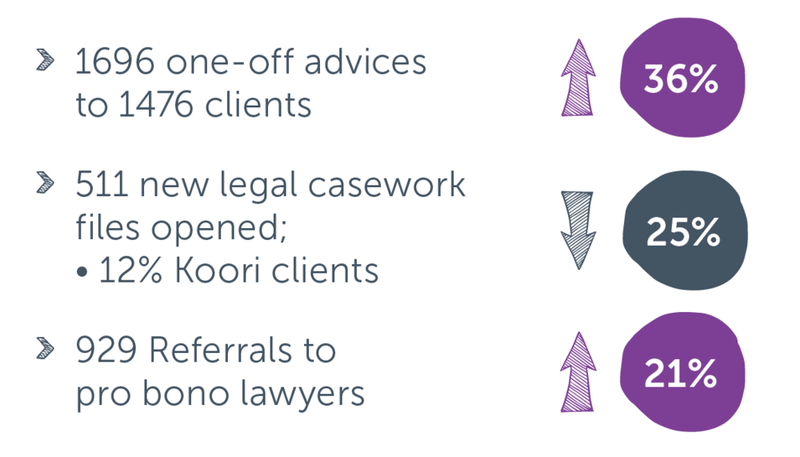 This financial year, that has translated into over 30,000 hours of pro bono work unlocked; help provided to 6,882 requests from people and community organisations, as well as 80 submissions, working groups and collaborative projects to challenge and change unfair laws. But we’re not content to rest easy. Over the last 12 months, we’ve undertaken a detailed review of our strategy, to identify what’s been working well and what we’d like to do better. We identified partnerships, outreach to find clients, and learning and evaluation as being key elements of what makes our work impactful. We’ve also decided that we want to increase our focus on innovation in program design, advocacy and law reform, and staff and volunteer support. We will be making some changes to support our new strategy, including appointing our first ever head of advocacy in 2018. Late last year, we commenced an ambitious digital innovation strategy, which centres on the development of our online tool: the Legal Help Gateway. With initial funding from Google via its Impact Challenge, the Gateway will provide a technology-driven, efficient tool for matching people’s unmet legal needs to pro bono lawyers with relevant expertise and to our digital self-help tools. It will increase access to legal help and increase pro bono opportunities for lawyers, as well as improving our own efficiency. We’re very excited about the potential of the Gateway as it develops over the next several years. Over the last financial year, we received funding from the NSW government for our first health justice partnership in NSW. We also supported the establishment of Health Justice Australia, which will work to achieve better health and justice outcomes for vulnerable communities, through effective integrated legal and health service delivery. Since its establishment, Justice Connect has been a paramount example of the notion that the sum is greater than its parts. We enjoy strong partnerships and support from a diverse range of people and organisations, all of whom are crucial to the impact we can have for vulnerable people. Finally, our success is underpinned by the extraordinary staff of Justice Connect, the volunteers (including practical legal training graduates and law students), and law firm secondees, whose passion for justice provides the energy on which Justice Connect runs. The legacy of our founders is lived out each day in the work of our team and the support of our many partners, for which I say thank you. About nine out of ten enquiries, both this year and last, were either assisted by one of Justice Connect’s programs or through Justice Connect making a referral to another legal service or to a support service that assists with non-legal issues. After 25 years of helping people access justice, Justice Connect is working to scale its impact. Millions of Australians have legal problems each year and do not access help. Justice Connect and its network of pro bono lawyers want to do more to assist. When a service model like ours involves people helping people, traditionally, scaling involves finding more people to do the helping. This means more staff at Justice Connect processing requests for assistance and placement with lawyers. With funding for legal services scarce, this is difficult and costly. So over the last year, we have been looking at different strategies to make the most of our fantastic people – Justice Connects staff and network of pro bono lawyers – so that their work can have the biggest impact. In particular, we've been looking to digital innovation strategies. In late 2016, we were a finalist in the Google Impact Challenge, proposing an online Legal Help Gateway - a platform to assist Justice Connect to efficiently match people and organisations with the lawyers who can help them, as well as self-help resources and links to other agencies. We received $250,000 in seed funding from Google.org to start work on our idea. We've started down a path of transformation – toward doing things differently to reach more people, in more ways, and in more places. Our bold vision is that Justice Connect will be accessible for people needing help, for workers that want to find the right help for their clients, and for organisations that need help for themselves. We will have guided online entry points that make understanding our services and whether we can help clear and easy. Applying for the help of a lawyer will be quick and transparent. We will have self-help tools to build peoples' understanding of their issue, and where they sit in a complicated system. These tools will free up our time so we can provide intensive support to vulnerable clients. Technology will help us leverage pro bono too. With better systems tracking availability and interest within our pro bono network, we can allocate matters efficiently and help more lawyers contribute pro bono work more easily. In 2017, we've started co-designing our Gateway by involving all its future users in our design process. We've held 14 workshops, involving clients, community legal centres, courts, Legal Aid Commissions, regulators, social services organisations, law firms, barristers and our staff. They have helped us understand peoples needs and frustrations, and the best opportunities to add value to Justice Connects work using technology. We're excited about our digital future, about all the extra people and organisations we'll reach, all the time we'll free up for our staff, and all the extra hours of pro bono that we'll unlock to scale the number of people we can help. This way, we'll ensure well have the capacity to provide intensive support to people when they're most vulnerable. First and foremost, we would like to acknowledge the people of the Kulin and Eora nations, and their elders past and present, on whose land we do so much of our work. We offer a special thanks to our patrons, Julian Burnside AO QC and Professor Gillian Triggs, whose support has been a vital element in our supporter engagement and fundraising work. Their commitment to human rights and access to justice has provided a tangible benefit to Justice Connect through their ongoing support of our work. We couldn't thank everyone all in one place!